UPDATED: DEC 27, 2018 Mousse très présente et qui tient longtemps. Robe trouble à la couleur d'ambre avec des reflets jaunâtres. Saveurs de céréales et de caramel. Une bière satisfaisante et à essayer si vous passez en Normandie. UPDATED: AUG 23, 2018 Bonito color ámbar. Terriblemente sobre-carbonatada. En nariz da notas muy suaves de caramelo y fresa, algo de bollería e higos secos. También hay un punto cítrico. En boca es algo más sabrosa. El dulce, el ácido, el salado y el amargo están bastante bien equilibrados. La fresa se nota algo más y aparecen también notas rancias, además de lo ya visto en nariz. Textura ligera y buena bebestibilidad, a pesar de estar tan sobre-carbonatada. Recomendable. Bottle. Pours a hazy brown colour with a thin white head, light malt aroma, the taste is medium bitterness and with a dry bitter finish. 330ml bottle from madeincalvados.com. Pours a cloudy brown, off-white head. Aroma is herbal. Taste is medicinal, herbal, murky with an odd sweetness. Clearly a brewing fault here of some description. Drain-pour. Pours hazy amber with a medium frothy off white head. Aromas of rye bread, caramel, citrus, floral notes. Taste is quite malty and fruity with moderate bitterness. Mouthfeel is medium bodied with medium carbonation. Enjoyed it. Strong yeasty side. Clear and ambered robe. White foam. Lovely aromas ! 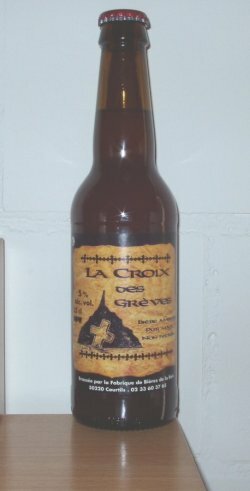 Bottle from St Michel, Le Comte, Beauvoir, Normandy, France. Dark, cloudy amber coloured with tart red fruity flavours, malty and wheat notes followed by a dry, creamy biscuit finish. Bottled. Hazy pale amber, lively but brief head. Mild fruity nose. Sweetish with light body and clean, rounded mouthfeel. Faint flavours of caramel and overripe fruits. Low bitterness. Pours an amber copper color wiht very fizzy white head mostly diminishing without lacing. Some sour vineous fruits in nose. Green fruits in flavor with a tart and dry slightly sour finish. Body is too thin. Don’t know if its infected or if it’s supposed to taste like this. It’s not really unpleasant but nor is there anything appealing with this beer either. A waste of calorie intake.